Has today’s technology advanced enough so that the line between the real and cyber worlds has vanished? Will this unchecked digital landscape provide new social predators with opportunities to unleash terror and pain on unsuspecting victims, while avoiding detection? The CATS Team is the next generation of hunters in the cat and mouse game of cyber warfare, unlike any seen to date. How can they prove that the evolution of 21st century video game playing is far more serious than an after school distraction for kids? With supercomputers, the adage ‘bigger toys for bigger boys’ takes on a whole new definition. As members of the CATS Team - George, Ty, Ernesto, Mercedes, EZ, and even Juan - investigate their respective assignments, they find they are undermined by the willingness of organizations to simply pay cyber-ransom demands. The tampering with automated processes, driven by today’s explosion of technology use, is child’s play compared to the heavy competitive nature of The Gamers with their Supercomputer resources. Award-winning authors, Breakfield and Burkey, take their fans into this grittier story of The Enigma series to explore virtual hacking within our technology dependent world. 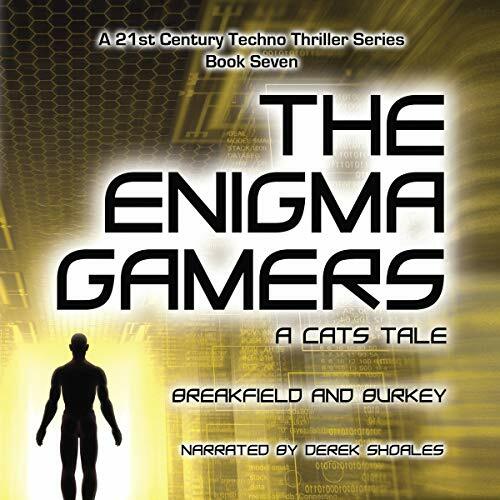 In book 7 of the series, The Enigma Gamers, The CATS Team, led by Julie and Juan, is committed to avenging and administering justice to evil doers in every corner of the real and virtual worlds. Well that was entertaining!! The Enigma Gamers take hacking to a still higher level when someone begins to take control, first of games, then of infrastructure putting all in danger. CATS is after them instantly, traveling across the world to find who is behind it. A spin off from the R Group, the CATS team looks like it will be another hit for these fine authors. You can read my full review at Mystery Suspense Reviews. First, let me say that this series is amazing. It would scare the pants off my parents if they realized that technology could be manipulated by anyone in order to wreak such worldwide havoc. I think that is what truly draws me to this series and the authors. They make it VERY realistic! Like the rest of the series, The Enigma Gamers: A CATS Tale is a gripping story. In this book the fine lines of cyber play and reality are crossed by two arch nemesis of the R Group. Competition runs high as the cyber bad guys attempt to win a game through manipulation, stealth, and bullying. Julie and Juan’s cyber assassin technology services team becomes immersed within the extensive and complex cyber games with real-life consequences. The cyber bad guys continue to remain one step ahead of the assassin team but in several unique twists to the plot, listeners are left gasping! Charles Breakfield and Roxanne Burkey are masterful storytellers with a unique gift of keeping their listeners on the edge of their seat. The addition of new characters was done well and clearly. Like earlier books, the authors build a connection to their audience bringing each new character one into the fold. I love the flirtatious wordplay between Julie and Ichabod! I can only imagine Quip’s face during the exchange. Each new book is slightly different focusing on different members of the organization. This book is no different, by tying it into the gaming field the authors are guaranteed to capture the interest of their audience in a different manner. Excitement, danger, and romance – all three present and masterfully connected. Dialog is realistic as is the plot. I applaud the authors in their ability to keep things clear although it could easily go complex at any point. Derek Shoales is amazing as well. He helps bring the book to life with his talented voice giving each person a unique sound. He helps guide the listener through the book in a non-hurried manner, keeping them intrigued with his voice and pauses. Magnificently done! I cannot imagine anyone else performing this series in the same manner as Shoales! There were no issues with the production or quality of this audiobook. It was well produced and performed. Audiobook was provided for review by the author/narrator/publisher. This is the seventh book in the Enigma series. I have only listened to books one and two, and although this can be read as a standalone, there is some context from previous books that is nice to know. This book is an action-packed technothriller with all the ingredients to have an exciting ride. There are multiple characters and several parallel situations that create a very dynamic plot. Yet, I was unable to connect with the characters and get invested in the story. I had similar experiences with the first two books, but I wanted to give this one a chance. I think the issue, for me, lies in the lack of character development, and the fabricated descriptions and romantic scenes. Somehow they do not feel natural, and being the characters mere archetypes does not give me anything to keep going. Derek Shoales does an incredibly good job differentiating characters by giving them different voices, styles, and accents. I found many of them a bit forced, which make the narration a bit tiresome to the ear. I think it would have helped were it done more subtly. This might be one of those ‘it’s not you, it’s me’ situations since I have seen great reviews and ratings for this series. It is okay, just not for me. I loved this book from the start. I’ve read the previous books and really enjoy recognizable faces, although the authors’ comprehensive back story gives newcomers enough information to jump straight in. I loved Julie as the focus character, as she’s one of the series’ best and most interesting characters. I loved the level of detail into the hacked systems which was also pitched right because you don’t need to be a programmer (which I’m not) to understand what’s going on. I loved the premise of the book and its executed excellently. I won’t provide spoilers as a I hate doing that but it’s got great pace and is a really fascinating story that drew me in from the start. A really fast paced story with the right level of detail. Great characters and great story make this a must read. In ways it’s a scary thought that the level of control that the guys holding these companies/cities to ransom have is something that could happen. The narrator does a great job of adding to the sense of pace and brings each of the characters to life. A great voice to listen too for this type of book!